Non-native invasive (NNI) plants are exotic species that are also ecological pioneers and colonizers. They are plants that, once introduced, can quickly establish themselves in ecologically disturbed communities. 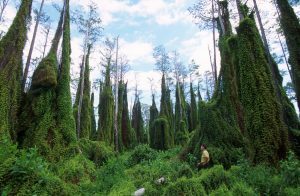 Non-native invasive species typically displace native flora because they have faster growth rates, efficient dispersal mechanisms, and tolerance of a wider range of conditions. Because they are not normally found in the region where they have been introduced, non-native invasive plants often lack natural predators and diseases that control their populations in their native environments. It is important to emphasize that not all non-native species are invasive and that not all invasive species are exotic. Many of the plants found in nurseries are not native to our county, and neither are many of the crops that we grow. Does that mean that they are bad? Not necessarily. Many non-native plants lack the characteristics to spread rapidly in a new environment and never become a problem. On the other hand, some native species become invasive when their environment is disturbed in a way that favors them over other species. Why Should I Organize a NNI Removal Event? Invasive plants have become recognized in recent years as a major threat to the integrity of natural areas. These species have the ability to invade natural systems and proliferate, often dominating a community to the detriment and sometimes the exclusion of native species. Invasive species can alter natural ecological processes by reducing the interactions of many species to the interactions of only a few species. Introduced species may compete directly with native species for nutrients, sunlight, and space, and indirectly by altering the food web or physical environment. Invasive species may also prey on or hybridize with natives. Native species with limited population size or ecological range are particularly susceptible to displacement by aggressive exotic or translocated species. According to a 1996 report by the Nature Conservancy, invasive species have contributed to the 42 percent population decline of threatened and endangered species in the U.S. Many also pose threats to agricultural areas, urban parks, yards, and roadsides. While only a small percentage of the 4,000 estimated exotic plant species in the U.S. cause problems, just 79 non-native plant and animal species have already cost the U.S. economy $79 billion. Non-native species threaten two-thirds of endangered species worldwide, and are considered by some to be second most important threat to biodiversity after habitat destruction. Trees, such as tree of heaven, growing several feet a year and out competing native species through a toxin that it excretes, killing other plants around it. Non-native invasive plant removal is not expensive to perform; unfortunately, it is a huge undertaking in most areas. 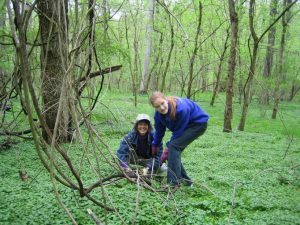 It is important for this work to set realistic goals based on the number of volunteers you have and the scope of the non-native invasive species problem in your watershed. You may be attempting to remove NNI species from a local park, or from your member’s gardens, or you may be targeting a stream valley where purple loosestrife is running rampant, or attempting to save a group of 200-year-old trees threatened by ivy. Whatever the case, you will want to write out your specific goals and let them guide your work plan. Encourage and empower citizens to participate in other activities aimed at improving water quality in their watershed. The cost associated with putting on an invasive species removal event can be as low as the cost of your time. Removing invasive species can provide excellent publicity for your organization and others who helped you put it together. If approached, businesses are often willing to cover the costs of many of your necessary items. Trash bags – Four dollars for a box of twenty. It is generally recommended that the plants go in plastic bags to the waste facility, not to a composting facility, as that con further the spread of the species. Tipping fees – Depending on the amount of materials collected, these costs can be considerable ($400.00 or more) however they are generally waived for cleanup events. Tools, gloves, and safety vests – You can ask participants to bring their own gloves and tools. Safety vests cost about $10.00 a piece. Because it does not cost a lot of money to put together an event of this type, you may not require any help in financing your work. If you are interested in getting some help to accomplish your goals, there are a lot of places to look for it. Your local dump – the most expensive part of any invasive species removal are the tipping and hauling fees. Request to have the tipping fees waived for the vehicles carrying the invasive plants you collected. Trash collection services – you may be able to get a local trash collection service to donate their services in picking up and hauling the plants you have removed. You can also ask the property owner if s/he will arrange for the pickup and hauling away of the invasives you collected—after all, you just helped improve their property! Your local government – may be able to lend you tools and gloves or may help haul away your work. Local business people, club leaders, and government officials. Ask them to give what they can: cash, equipment, supplies, or services. Trash bags and gloves are a must and can often be obtained as “in-kind” donations from grocery or supply companies. Food and drinks for the workers are essential and can usually be obtained through donations. Restaurants and local grocery stores might give you refreshments. Don’t forget first aid supplies – this activity, while not dangerous, can cause cuts and bruises! The act of removing invasives is relatively straightforward, however there is a lot of additional work that must take place before and after the event takes place. Maintain the area where the plants were removed. Consider assigning a team of volunteers to “maintain” the pulled area. It often takes 3-5 years to deplete a seed bank in order to discourage the return of non-native invasive species. Establish an organizing committee: a core group of individuals dedicated to organizing and implementing the invasive species removal event. First determine location of invasive species removal and project date (remember to choose a rain date). Next the committee should conduct a site visit, arrange for plant disposal, recruit volunteers, gather materials and supplies, contact property owners, and solicit project support. Where are the areas where the pest specie grows out of control? After you remove the plants, how will you dispose of them? The goal is to increase native plant habitat and create healthy forests and watersheds — not to interfere with balanced ecosystems. You may consider focusing on areas of special need: communities working for environmental justice, high impact areas, land with ecological diversity, historic farmland, agricultural communities, or preserves. A member of the organizing committee should walk the area 8 to 10 weeks before the event. A scouting survey of the removal area will give a better idea about the amount and types invasive plants volunteers to be removed. A survey will also allow the committee to approximate how many volunteers will be needed for the removal event. A member of the organizing committee should also walk the area two weeks prior to the project date. During this walk, the committee member should create a series of maps that will help crews locate work areas. The surveyor should also note whether invasives can be hauled out on foot and if any special equipment may be necessary. Is the site too large for a single removal day or will several events be required? Are there hazardous substances present that make a stream unsuitable for an invasive species removal by volunteers? Select the project date and time of the event. Determine the date 8 to 10 weeks before the event. Typically, Saturday mornings or Sunday afternoons are the best time to schedule an event like this. Be careful to avoid a holiday weekend or a weekend when the switch is made to and from Daylight Savings Time. The organizing committee should also allow adequate time for project planning and volunteer recruitment. If equipment will be borrowed, the organizing committee should make these arrangements first, and select a day when the equipment is available. Remember to establish a rain date! 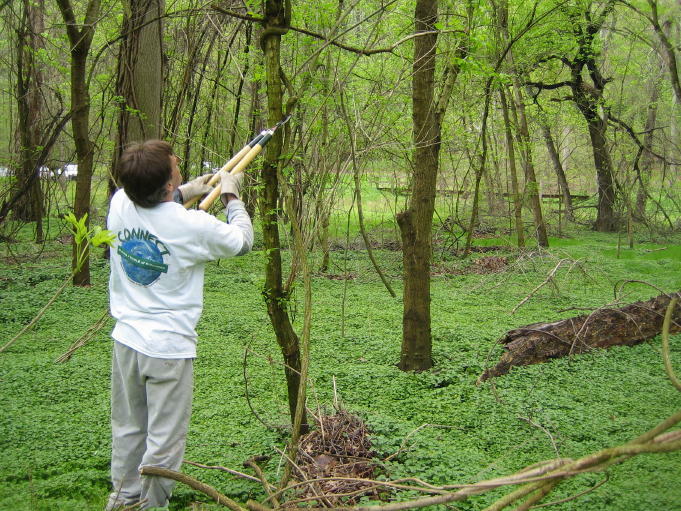 An invasive species removal event typically lasts about four hours. The organizing committee should also plan an additional half-hour before the event for setup and a half-hour afterwards for cleanup. Additional time may be required after the event, if a picnic or barbecue is planned. Locate and reserve a central meeting place. A parking lot is an ideal central meeting place, if it’s not in use on the project date. On Saturdays, school, bank, office, or church parking lots are usually empty. The organizing committee should receive permission from the proper authorities before designating a parking lot as the central meeting place. A letter, including the project purpose, date, time, and a promise to leave the parking lot clean, will typically receive a favorable response. Avoid high traffic areas and always use extreme caution. If volunteers will not have access to a restroom, seek permission from a local business to use their facilities if necessary. If facilities are not made available through local businesses, the organizing committee should arrange for the rental of portable facilities. Transportation for disposing of removed plant material. Obtain written permission from landowners with property in the proposed work area. Venturing onto private property without permission is trespassing; you may be subject to arrest. The organizing committee should invite the property owner to participate in the event. If the property owner cannot participate, the organizing committee should obtain written permission for volunteers to remove invasive plants from their land. If you are unsure of the landowner, county tax maps, located in county planning offices, can provide property ownership information. The organizing committee can also determine the property owner by talking to people who live close by. Before sending the removal teams out to work, the organizing committee should emphasize the importance of staying on public property and public roads, except where expressed permission has been given by the property owner. Recruit volunteers from your local community. 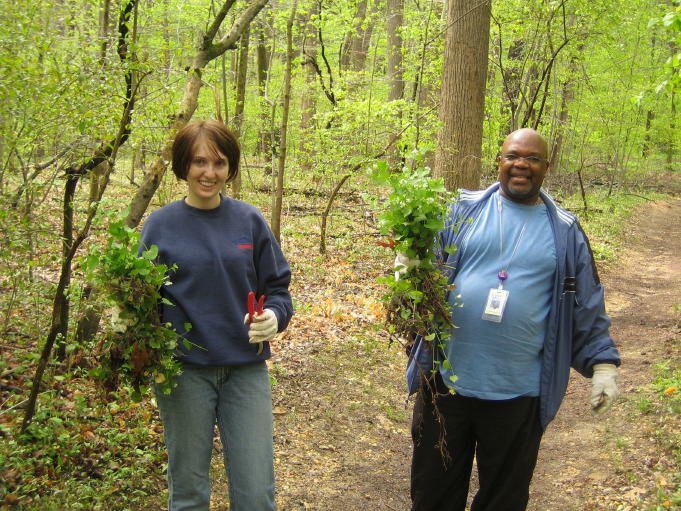 Anyone can assist in a non-native invasive species removal project. Children under the age of 18 years should be encouraged to participate but should have permission from parent or guardian. The organizing committee should provide adequate supervision: one adult supervisor for every six children. Group size depends on the amount of invasives and area of land at your removal site. A removal event could involve anywhere between five and 50 people. Consider the number of volunteers you can effectively manage and still ensure the enjoyment of all. Initiate volunteer recruitment approximately 6 weeks prior to the project date. We recommend contacting groups via telephone and getting an announcement posted on email listservs. Event calendars (including places of worship and organizational bulletins) and word of mouth also are effective. As a rule, 50 percent of those people who initially sign up for an event will not actually participate. For this reason, the organizing committee should aim to recruit twice as many people than will be needed for the project. The organizing committee should establish a phone number or email address that volunteers can contact to register for the event. When volunteers register, get their name and contact information. As volunteers respond to recruitment activities, members of the organizing committee should advise them on what to bring and how to dress. Recommend that volunteers wear sturdy shoes or boots, clothing that they don’t mind getting dirty, work gloves, and a hat or outerwear as the weather dictates. Volunteers should also be encouraged to use sunscreen and insect repellent. Advertise the project as much as possible. Event publicity should complement your volunteer recruitment efforts by drafting, reproducing, and distributing fliers; drafting and distributing press releases to local newspapers and/or organizational newsletters, and offering presentations at group meetings. Recruitment messages should include the name, day, date and starting time of the event, the rain date, location and directions to the central meeting place, name of the group or organization doing the work, and a contact’s name and information. Have a phone number or email address where volunteers can register and include the information in all advertisements. Refreshments are one way to thank volunteers for their valuable time and hard work. It is recommended that the project sponsor provide non-alcoholic beverages. If beverages will not be provided, the organizing committee should encourage participants to bring their own. Simple refreshments (coffee and doughnuts, cookies and punch) may be offered during registration, or as a time for volunteers to celebrate a job well done at day’s-end. A picnic or a barbecue is also a nice way to thank volunteers. Local businesses and/or the volunteers themselves (pot-luck) may be willing to donate food/drink, coolers, cups, ice, paper goods, etc. 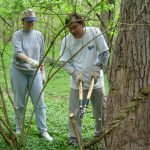 As soon as you have scheduled your invasive species removal event and created your materials, it is a good idea to schedule volunteer team leader training. Keep your training brief, informative, and fun. Be sure to cover safety, liability, invasive plant identification, and removal methods. Helping to clean up the removed plants. Below is a list of materials that you may need for your event. The exact materials will depend on the type of invasive plant that you are removing and the conditions at your particular site. Designated a volunteer to take photos of the event. When your volunteers have arrived, have them sign and return their liability release forms and then break them up into groups to work with a team leader. The team leader will work with the volunteers to ensure the correct plants are removed and that areas with sensitive species are avoided. Provide a sign-in sheet for volunteers at the central meeting place on the day of the event. The sheet should include spaces for the volunteer’s name, address, phone number, and email address. (Remember to provide pencils or pens.) Volunteers who have not completed and signed a safety liability release form must do so before participating in the invasives removal. Nametags will help volunteers get to know each other. Also think about introducing the event and making the connection between the day’s work and the health of your local forests and waterway. Many people have an interest in their local streams but don’t understand much about river systems. You may wish to provide a map of your local waterway so that people can orient themselves in the watershed and make the visual connection between the work site and the river. Pass out invasive plant identification materials and maps to specific work sites. Also hand out the tools and collection bags to each volunteer. Finally, brief them on removal techniques and send them out to work. Give them a specific goal to complete because otherwise (sadly) they will likely never feel finished. If they wish to continue after they have completed their task, ask them to help another group with their work. Make your event as enjoyable as possible for volunteers. Consider providing music – a portable radio or two can lighten the mood and turn the work into an enjoyable event. Locate a convenient shady spot where workers can rest, and provide seating and refreshments. There are many different methods for non-native invasive plant removal and not all work with each species of invasive plant or each circumstance – for example a controlled burn is not generally possible in an urban environment, or mowing may not be possible on a steep bank. Neither of these methods is conducive to volunteer pull events and manual methods should be the focus of your event. Leaders should be trained in invasive plant removal methods and there should be enough leaders to effectively oversee volunteers. Hand pulling: Pull seedlings and small or shallow-rooted plants when soil is moist. Dig out larger plants, including the root systems. Use a spading fork or weed wrench for trees or shrubs. To prevent spread of seeds of undesirable ornamental plants, cut off flowers and/or seeds or fruits before they ripen then bag them and send them to the landfill. Cut a “window pane”: If vines growing up trees and their root systems are very large, use this method. Cut the vine at the base of the tree and at shoulder height to create a “window pane” and remove the vines from that area. Then remove a swath around the base of the tree. The vines above the cut area on the tree will eventually die and fall off. Girdling: For trees girdle the tree by cutting through the bark and growing layer (cambium) all around the trunk, about 6″ above the ground. This technique in effect starves the tree of the water and nutrients that it needs to survive. Girdling is most effective in spring when the sap is rising, and from middle to late summer when the tree is sending down food to the roots. Clip off re-growth. Allow time at the end of the day for participants to relax, socialize, and enjoy the fruits of their labor. Take the time to review the work accomplished. In doing so, you are letting your volunteers know how successful they were and giving them a sense of pride and ownership of the work site. This will help in recruiting them later. 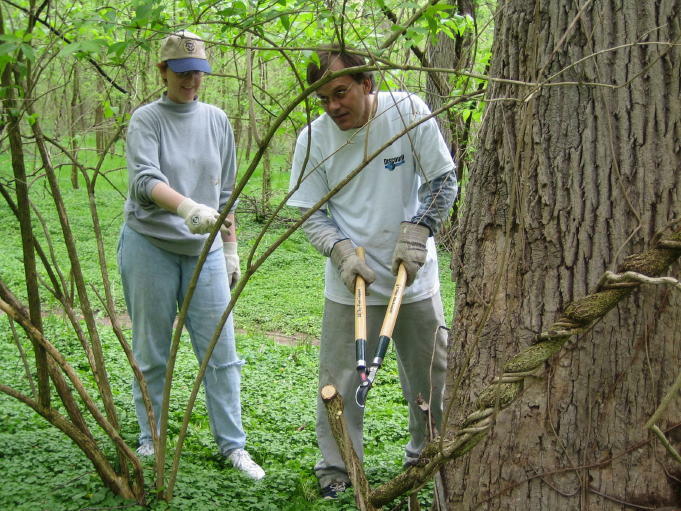 You may even recruit volunteers to revisit the area to keep it clear of invasives. After the volunteers have finished their work, the job is not done. If you are bringing the removed material to the dump yourself, leave time to load the material into trucks and to drive to the dumpsite. If someone else is going to collect the plant material, help them do their job by bringing the material to a central location. DO NOT DUMP CUT INVASIVE PLANTS IN THE WOODS! Doing so can actually propagate the plants further because they often react to being cut by sending out new shoots and roots. After the removal you should thoroughly document your work and monitor and revisit the site regularly to monitor its recovery. You should document your work by mapping the exact location of the removal work both on a map and by placing markers at the site. Include information on the type of invasives found at the site before removal and the degree to which the site was infested. Quantify the amount of invasives removed from the site (number of bags of plants, weight of materials, or some other measure). Whatever measure you use, remember to be consistent from one removal event to the next. Include recommendations on following up at the site with additional removal work, native planting, slope stabilization, etc. After the invasives removal event, please remember to collect the sign-in sheets. Use this information to generate certificates of appreciation for each volunteer and organization involved in the event. You can also compile the information into a community database of individuals and organizations to facilitate networking among groups and individuals interested in water quality issues. Publish the photos taken during the event along with the statistics from the day’s work (number of volunteers, amount of invasives removed, size of area cleared). Contact the local media that helped you advertise before the seed collection and share your results. Also contact the event sponsors sending them a thank-you and the results of the event. Be sure to recognize everyone in the community who made your success possible. When the event is completed, it is important to evaluate what you accomplished. It will help future planners to capitalize on your successes and avoid your mistakes. But you can’t wait until the end of the event to think about evaluation. An evaluation committee should be chosen in the planning stage to monitor the entire sequence of events, noting what worked well and what went wrong. Poll your volunteers as they leave, either by providing a questionnaire or by simply having the team leaders ask their crews what they thought of the event. Within a week, get your committee together and make a list of what went well, what needed improvement, and what, if anything failed completely. What problems did they have? What would they do to improve future events? Use this information to help plan your next event so that you continually learn from your efforts.